Gabriela has been an artist for as long as she can remember. Both her parents are Argentinian, but the language barrier did not hinder her mother. Seeing that Gabriela had a love of the Arts, her mother enrolled her in tap dancing at the age of 4 and two years later in piano classes. It was her mother who encouraged her to take Drawing classes at the local public library and then Life drawing courses at the age of 13. Gabriela went on to receive her BFA at Hartford Art School and her MFA degree at Rhode Island School of Design. Upon graduating she moved to NYC to pursue her passion in sculpture and mixed media, exhibiting her artwork in numerous galleries and museums. 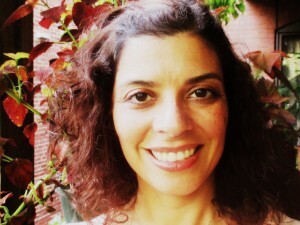 Her work has been reviewed in a number of publications such as the New York Times and Hoy, a Spanish language newspaper. Additionally, she worked as a House sculptor for Izquierdo Studios, making props and costumes for theater, commercials, and music videos. Simultaneously, Gabriela began her career as a teaching artist, working with such organizations as Learning through an Expanded Arts Program and Arts Horizons. This developed into working with a number of urban public schools and various learning institutions. During her work with Community Center School at PS 16, she received a Parents As Arts Partners grant from the Center for Arts Education. After 10 years, she moved to Granby, CT where she received a grant from the Granby Education Foundation to work with the Holcomb Farm Learning Center and local middle schooler students in creating Pit firings. In 2008 she moved to Springfield, MA where she currently resides, and became the Arts Integration Magnet Resource Teacher for Gerena Community Magnet School: Montessori and the Arts. As their AIMRT she worked with Smith College and many community-based organizations, where she met Priscilla Kane Hellweg. After her grant funded position ended, she continued as a teaching artist working with Hasbro Summer Learning Initiative as a curriculum coach, developing and implementing numerous arts integrated programs. For the past two years she has been the visual arts teacher at Indian Orchard Elementary. Gabriela joined Enchanted Circle Theater as an Associated Teaching Artist in 2014.